The Inn on Coventry has been in business since 1981. This “mom-and-mom restaurant” has been feeding hungry college students and locals ever since. The matriarch died in 2010 (she was 96), and there is commemorative plaque hanging above the cash register. Word to the wise: since it is so popular it is always crowded on the weekends. Expect a wait. Also, they won’t seat you until everyone in your party is there. Despite what the website claims it is not open on Friday evening. I walked there for dinner last Friday, looking forward to trying their fish fry, and was sadly disappointed. I asked my waitress this morning, and she told me they haven’t been open for dinner for about two years. I suggested they update their website. 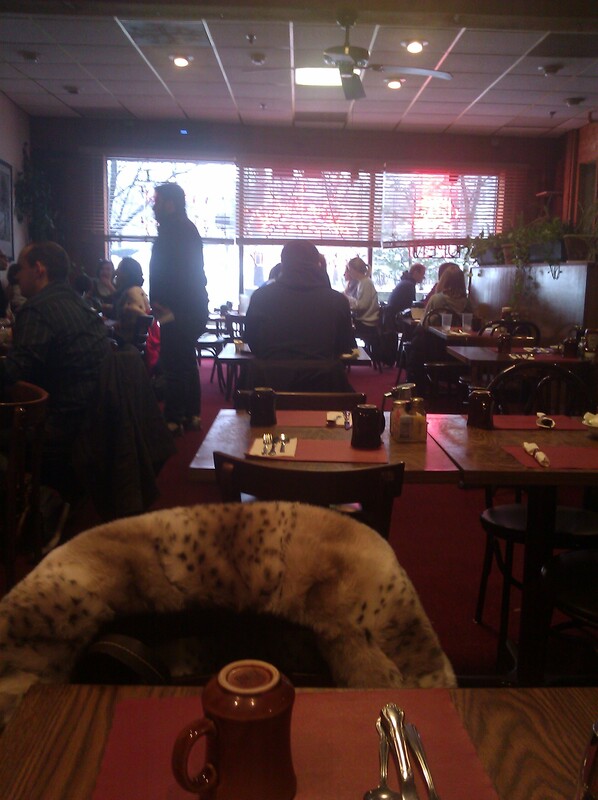 I first came here before I lived in Cleveland Heights (invited by local friends who were in the know), and it is one of my favorite breakfast and lunch places in the area. I ordered the Swedish eggs, which are eggs scrambled with lox and cream cheese, and fell in love. I treated myself to breakfast this morning and indulged in this favorite. The saltiness of the lox is balanced by the creamy chunks of cream cheese. I make this at home now, but I add chopped spinach. 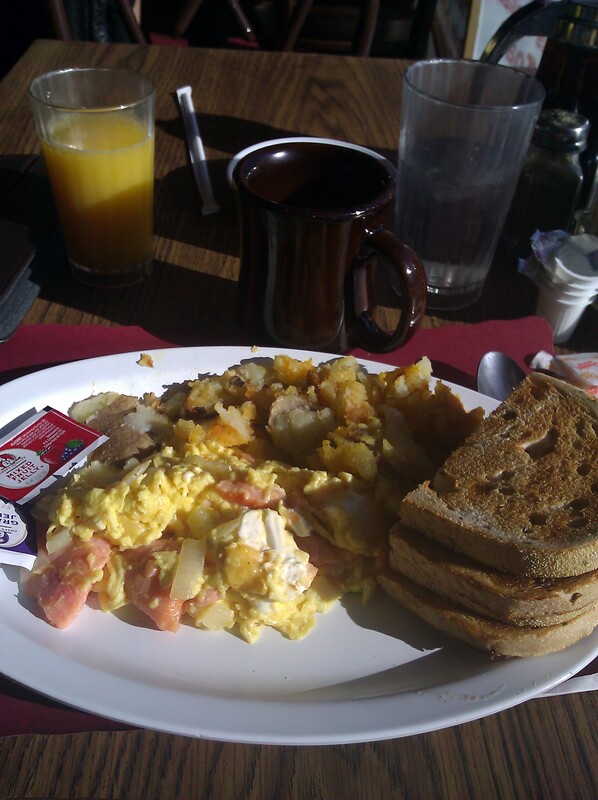 The dish is served with your choice of grits or home fries and toast. I chose the home fries and Jewish rye (not like the marbled rye some places serve). There is no better comfort for me than starting the day off with buttered rye toast and jelly. My second favorite breakfast offering here is the Fresh Banana Walnut French Toast. 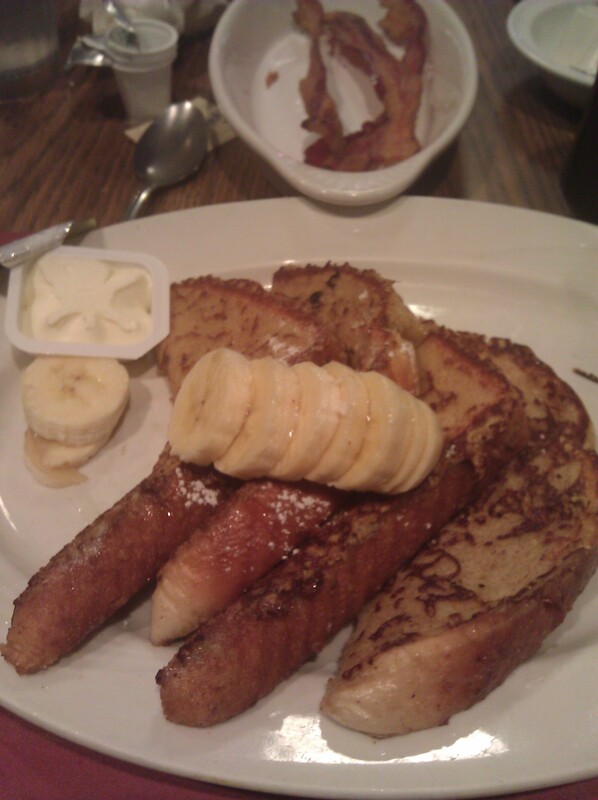 The thick slices of French toast are topped with fresh sliced bananas. The flavors meld together really well, and it is simply a flavor explosion. It doesn’t get much better than this. I had a similar French toast at Deagan’s the other day, and although it was good it simply didn’t compare to Inn on Coventry’s. I ordered a side of bacon for good measure, because everything’s better with bacon. Inn on Coventry is also known for their Eggs Benedict and Eggs Mando – and they also offer a Veggie Mando topped with avocado instead of Canadian bacon for the vegetarians). The lemon ricotta pancakes are also divine (or any of the pancakes really… although I haven’t had the nerve to order the Reese Cup pancakes). If you do order the pancakes stick with one at first. The pancakes are huge and, as you can see, span the whole plate. Although I usually order breakfast, I can also personally vouch for the sloppy joe, the Coventry Burger, and the California Club sandwich. And I am usually critical of sloppy joes that aren’t my mother’s “white trash” version that consists of a pound of ground beef, a half bottle of chili sauce and 4 oz of Velveeta (try it – you’ll love it). All of their items are made fresh and are just like Mom used to make. I intend to try as many items on their menu as I can, but it is hard when such delicious favorites are available. They offer a full service bar if you want a mimosa or Bloody Mary. Also, one thing that simply must be mentioned is that Inn on Coventry has delicious coffee. It is a Kona blend that simply can’t be described. It is very smooth and not at all bitter. Plus, the waitresses are constantly coming around to ensure your cup is full. Come for the food, stay for the service. And don’t forget to always overtip your breakfast waitresses! Open 7 days a week from 7 a.m. (8 a.m. on Sat/Sun) to 2:45 p.m. Previous Previous post: Bearden’s is back, baby!